With the help of encouraging parents and teachers, ordinary kids can become much more. By showing empathy towards others who might be different, kids can strengthen their own confidence, making it that much easier for them to share, care, and give! We’ve recently been talking about volunteering, not only about why and how to get your family involved, but we’ve also focused on specific non-profits whose focus is inclusion for kids. If you and your family have become more involved in your community or a specific cause, many times it leads to greater connection and dedication to the cause. If you’ve found yourself looking for even more ways to become involved in volunteer opportunities, what are your options? For adults, joining the board of directors or donating money to philanthropic organizations are options to consider. But what opportunities are there for kids? The following are five amazing nonprofit organizations that were founded by kids and can serve as inspiration for your family. When Hannah Taylor was five years old she watched a homeless man eat out of a garbage can and a woman push her belongings down the street in a cart. Hannah was saddened by the fact that people were homeless. She learned what she could about homelessness, and, with the help of her parents, the Ladybug Foundation was formed. It is a Canadian non-profit that advocates, educates, fund raises, and donates to support the homeless population. At 12, Craig Kielburger read a story about a former child slave in Pakistan who dared to speak up about human rights and was murdered. Craig and his brother Mark, wanted to ensure that other kids in the world didn’t suffer the same fate. They started their nonprofit in the hopes to free children and their families from exploitation and poverty around the world. What happens when two nine-year-old best friends living in Costa Rica become passionate about saving the rainforest? They start a non-profit to do just that. Not only does Janine Licare and Aislin Livingstone’s foundation offer education, but the organization also sets up programs to preserve and protect both the rainforest and the wildlife that lives within in it. Jonas Corona volunteered at the homeless shelter with his family every month starting at the age of six. He was struck not only by what the children lacked in material goods, but what they lacked in self-esteem. His mantra, “Every child should look in the mirror and love what they see,” launched a non-profit dedicated to serving disadvantaged youth through donation and leadership programs. Similar to Jonas, Mackenzie Bearup and her brothers donated their time to homeless shelters. As avid readers, they noticed that most families that end up in shelters only have the clothes on their back. Since they launched in 2007, the organization has collected and donated over 460,000 books to homeless shelters and residential treatment centers across the country. All of these organizations started with a few passionate kids with a strong desire to help a specific community. Volunteering is a wonderful experience, but for those who want to dedicate their lives to a cause, think about starting a non-profit, just like these kids and their families. 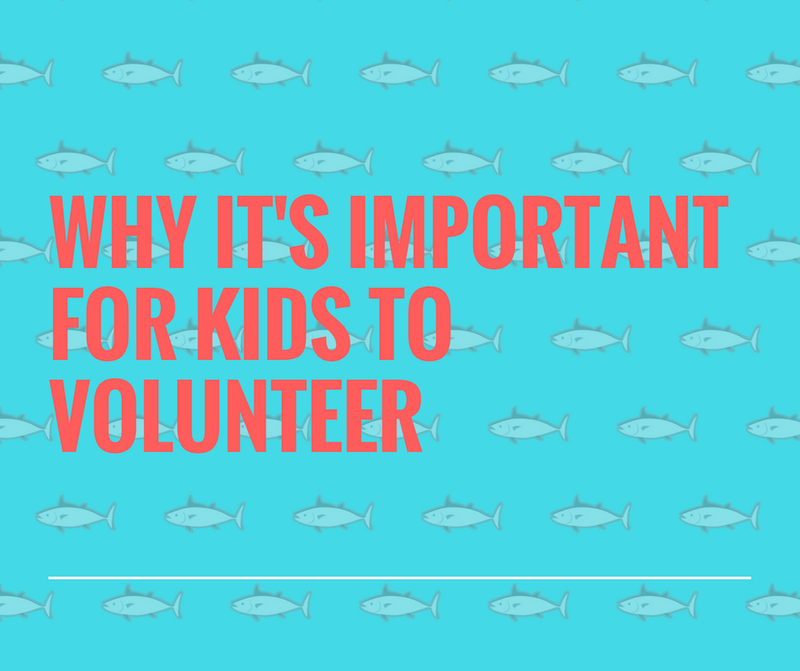 We’ve recently covered many of the reasons why you’d want to encourage your kids to volunteer based on the skillsets and perspectives it can offer your children. Now that you’re even more aware of its value and possible positive impacts on your family, we thought it might be helpful to offer some suggestions as to how to get your children involved. The first step, as we mentioned (link to last blog), is to engage in an activity or a cause that is meaningful or important to your child or your family. Some kids love being around animals. Some kids love being outside, and some kids want to be involved with a friend or family member that may have a medical condition. Other kids may not have a specific interest or have a strong connection to any specific cause, and that’s okay. It becomes important for parents to expose their kids to new and different things in order to spark their interest to an organization or a cause. We’ve outlined seven different ideas for you and your family to volunteer. Here are several different categories and corresponding ideas to get your volunteer experience kick-started. Advocacy and human rights – when we were children, many of us raised money for Unicef at Halloween. Unicef https://www.unicef.org/ now has a great program called Voices of Youth that will connect your kids to another child across the world. One of the largest organizations in this category is Amnesty International https://www.amnesty.org/en/ , an organization that tackles human rights violations from refugee and migrant rights to gender, sexuality, and identity causes. Animals – Kids can volunteer at their local Humane Society http://www.humanesociety.org/ , ASPCA chapter https://www.aspca.org/ , or rescue organization. Your family can help animals in your own home by fostering dogs, cats or other animals looking for their forever family. Arts & Culture – If your child loves the arts, some local children’s museums allow kids and their families to volunteer, giving them the opportunity to be in an environment that they enjoy. Environmental – For children that love spending time outside, environmental causes are easy ones to get them involved in. Have the family participate in a beach, canyon, or park clean up. Get involved in an Earth Day https://www.earthday.org/ celebration or join your local Sierra Club https://www.earthday.org/ chapter. Homelessness – There are many shelters and food banks set up in most major cities and towns to help support the homeless population. Whether you choose to put together packages that are distributed on the streets or serve meals to the homeless, there are many ways that your family can support organizations that support the homeless. Local Community – Your family doesn’t even need to leave your neighborhood to engage in meaningful volunteer activities. You can grocery shop or do yard work for a sick neighbor. Offer to repair toys or household items for neighbors. Start a neighborhood garden or toy swap. There are many ways to get involved to make a positive change in your own backyard – just look to see who may need help. Seniors – As the baby boomer generation continues to age, support of seniors in our society is becoming more and more critical. Pick up a Meals on Wheels https://www.mealsonwheelsamerica.org/ route and deliver food with your kids. Have your kids practice a skit, a song, or even a puppet show that they can put on in a local senior center. Even spending time and eating meals in a senior center with the residents can be a wonderful way to volunteer your time. Volunteering is a wonderful way to get involved in your community and clearly make a difference the lives of others. If none of the ideas above resonate, there are also sites, like VolunteerMatch.org, that can help you find volunteer opportunities in your local area. One of the hardest things to teach children these days, especially in an “all-about-me” society, is how to go outside themselves and help others. Even though we’re ever-increasingly connected in many ways, the internet and social media has also contributed to our sometimes feeling isolated and disconnected from others. Volunteering and reaching out to others in need is important for a child’s development. It can help them appreciate that none of us journeys through life alone and that we are all part of a larger community and world. But, volunteering can all also help children build a number of skill sets and tools as well as provide the opportunity for parents and children to bond as a family. Below are several additional benefits to having your children volunteer their time to a non-profit or other organization. Working with people in a volunteer environment is a great way to connect with others. We’re often working alongside people, whether it’s other volunteers or the people served by the non-profit who may be different or have different life experiences from us. Volunteering also allows our children to learn from and about others and build relationships with others, while working toward a common goal. As our children are exposed to people in different circumstances than they may be accustomed to, it helps them to develop understanding and empathy for others. The more time they spend trying to understand someone else’s situation or learning about the challenges of other people, the more empathetic they’ll become. Kids learn that although others may look different from them and have different life experiences, everyone is still united through many basic and common human experiences. Volunteering serves to broaden your child’s view of their own community as well. They have the opportunity to learn more about the issues and challenges in their local area. When kids can see how a particular issue is affecting their own neighborhood, they are more likely to develop the passion and commitment to continue to support the efforts to make people’s lives better in that community. If you and your family decide to participate in an organization like Habitat for Humanity or another project that builds and repairs houses for others, your child will learn basic building and repair skills. But volunteering is more than learning hard skills. It’s also about learning communication, organizational, and effective leadership skills. One of the greatest benefits a child takes away from a volunteer experience is the fact that they realize can make a difference. Children can see the immediate impact their volunteering does to improve the conditions or lives of those they’ve worked with. To celebrate National Volunteer Month during April, we’re going to be writing about organizations and individuals that are making a difference in the lives of children and teens across the nation. In addition to highlighting specific organizations, we’ll also spend some time talking about the benefits that volunteering can have on the life of your child and your family. The first organization we wanted to spotlight is a non-profit that focuses on inclusion. For those of you that have read the book, the Superheroes Club is all about teaching children the value of empathy, acceptance and inclusion. One of the main characters in the book, Alex, has autism spectrum disorder. Kids Included Together (KIT) is a non-profit that is on the forefront of inclusion practices and research. Their mission is to help the world see the ability in every child by helping other organizations and schools meaningfully include kids with disabilities. We had the opportunity to speak with KIT CEO, Torrie Dunlap, to learn about her perspective on the value of teaching our kids about inclusion and the best way to go about doing so. Why is it so important to teach kids about inclusion? TD: Our world is diverse. People we interact with every day think, act, move and communicate in different ways. Helping kids to accept and appreciate differences supports their social-emotional development, builds a positive self-concept, and may reduce aggressive behaviors. What are a few tips to have conversations with or talk about inclusion with kids? TD: Kids notice people’s differences and they will have questions. It is important that adults answer their questions in open, honest, and age-appropriate ways. Reading books that features diverse characters, like Superheroes, is a good way to introduce differences in a positive way. It helps to point out the ways people are similar, for instance, we all want to make friends, do well in school, and have fun, even though the ways we go about that might not be the same. What can we do in our communities to support inclusion? TD: The best thing we can do is to model an inclusive mindset for the children in our lives. This means being aware of our own biases and working to overcome them. It means having positive social relationships with all kinds of people and sharing them with our children. We can also all be more aware of who may be left out of our classrooms, sports teams, church activities, and camps. We can ask the leaders of these activities how children with diverse needs are accommodated and lend our support by offering to volunteer as an extra set of hands in the class or camp or by sharing Kids Included Together with them as a resource. If you’d like to learn more about inclusion practices, or Kids Included Together, visit their website at kit.org. As we discussed in our previous post, it’s essential to build up your child’s writing muscle. By encouraging your kids to read and write, you’re expanding their imagination, opening up their creativity, fostering their self-expression, building their self-confidence, and teaching them important communication and persuasion skills. Like any other exercise, the more often your children are encouraged and supported to write, the stronger writers they will become. There are many different methods that parents, teachers and other care givers can use to help build your child’s writing muscle. Consider a few different suggestions below. Journaling can be everything from recording daily activities to writing poetry and stories, to science journals. Kids can keep dream journals, a more traditional “Dear Diary” journal, or even an art journal. The first step is to find the right type of journal for your child. Their interests will drive the type of journal that they’d like to keep. The second step is to ensure that your kids know that it’s a safe space to express themselves. They have to know that their privacy is respected, which means no one in the household, not even the parents, should be reading anyone else’s journal. The third step, and another key is not to make it into another homework-like task. Kids should see journaling as something fun to do. If they have the right type of journal and feel safe doing so, journaling can be an activity that helps them to build their writing muscle. For younger children, you may want to create a writer’s toolbox. A writer’s toolbox is a place where kids can keep materials that will help to jumpstart their imagination. In addition to pens and pencils, it can house crayons or markers, string, ribbon, bright construction paper, scissors, and glue. It can include anything that you think may spark creativity, like stickers, sequins, glitter (if you’re daring and don’t mind the mess). The purpose of the toolbox is to have your child create something, a drawing or painting, a sculpture or anything they wish, and then to use that to help them write a story. You as a parent can help to transfer their thoughts and ideas on paper and then can go back and continue the story together. For kids that may be more hesitant to write on their own, this is a good way to transition into writing as a practice. Kids tell themselves stories all the time. So how do you harness that creativity on to the page? Writing prompts are a wonderful way to help your kids start a story. Prompts don’t have to be verbal or written. Spend an afternoon cutting pictures out of magazines and make a book of your own writing prompts for your kids. Visual prompts can work well for both young (and old) writers. If you’re still looking for inspiration, you can find hundreds of writing prompts online. Pinterest images can be a great source for prompts or even a walk around the yard or neighborhood. Reading is one of the best natural sources and motivators to encourage writing. For kids that enjoy reading, using a scene or a character from their favorite book can help to encourage them to create a story. The most important factor in helping your child build their writing muscle is your encouragement. The more supportive you are of your child’s writing efforts, the more likely they’ll want to continue to engage in the activity. Physical activity is important for kids for so many reasons – it helps to make them strong, confident, and physically healthy. Reading and writing are similar in that they also make our children stronger, but by developing their intellectual and emotional skills. Reading and writing are critical tools to begin building in children as early as possible. We’ve recently talked about ways in which to encourage your child to become a super reader, but it’s just as important to encourage them to become a super writer too. These skills are like muscles – the more you use them, the stronger they become. Why encourage them to write? Here are some of the benefits of encouraging your kids to write creatively. Most kids have fairly vivid imaginations. While we see it often in play time, harnessing this creativity and putting it on the page can be a magical experience. For some kids, understanding that they have the power to create stories like the ones they read by themselves, is transformational and often leads to even more creativity. Fostering this creativity also helps kids become better problem solvers. They will expand their thought processes to create characters, describe detailed scenes, and write dialogue for their characters. Not only is writing an important practical skill, it’s also a wonderful way for kids to express themselves. Many children may not have the verbal skills to express their feelings or they may not feel safe doing so. Writing offers a safe place for them to write down their thoughts and feelings without fear of judgment or retribution. Writing gives kids an opportunity to develop their own “voice.” They can express their thoughts and opinions, which in turn can build their confidence as they get to know themselves better. As your child begins to develop their skills, writing can help them to organize their thoughts and help them to begin to understand how to craft and shape persuasive arguments. Using structure and craft can help to build their analytical skills, and as they read more of their own writing, build their linguistic skills as well. All of these are critical skills that will help your kids in school and into their adult lives. 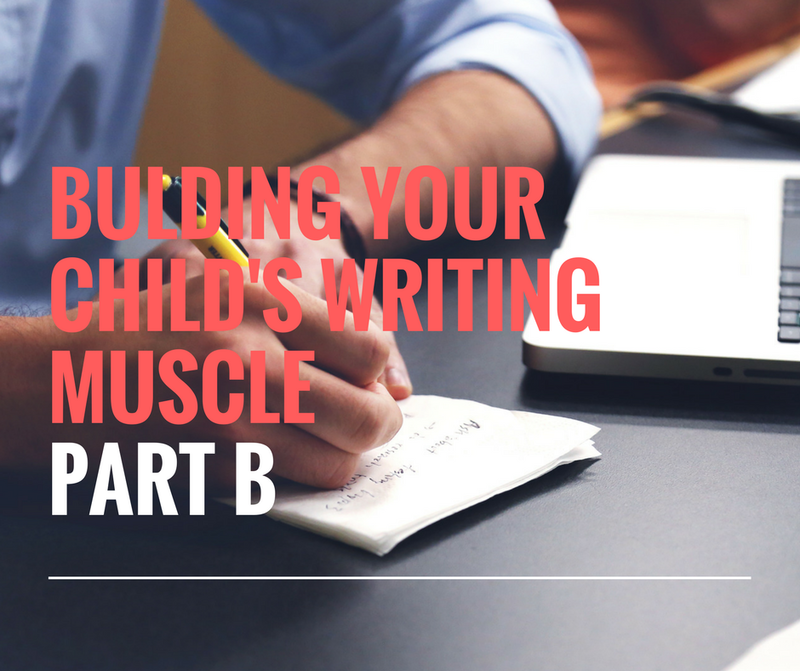 In our next post, we’ll discuss a few ways you can encourage and support your kids to help them build their writing muscle. Whether your child loves to read, or may be a bit more hesitant, it’s never too late to help them become super readers! Consider these five tips to help develop your child’s super reading skills. Many kids, especially young children, prefer being in a social setting for their activities, and reading time is no exception. So, spending time together, while family members are all reading their own books or reading the same book together, is preferable to kids being relegated to their own rooms to read by themselves. For kids who struggle with reading, in particular, they need encouragement and support to not only pick up a book, but to attempt to read it as well. The important thing for parents to do is assure kids that reading, like other skills, can be challenging to master, takes practice, but will be enjoyable and rewarding. Kids also need to feel their parent’s excitement and passion for reading, and especially, for reading with them. Does your daughter dream of going to the moon? Does your son love to cook? Making a list of topics that your kids are curious about can help both of you select books that they may love sharing with you. How often do we, as adults, say, “That reminds me of something I’ve read?” Books can be a bridge between individuals or between groups of people. Those bridges develop through conversations about shared experiences from books we’ve read or ideas we’ve shared from those books. Encourage your kids to talk about the books they’re reading, either at dinner time, during car rides or just while hanging out together. Engage the entire family in specific topics related to those books. Make reading part of your everyday discussion, and it will be easier for your kids to get more engaged in the reading process. They’ll also begin to see how reading can help them to build or strengthen relationships. Not every child will need encouragement to read. Some kids will develop their reading super powers, you’ll have more of a challenge getting the book out of their hands than putting one in. But, for some hesitant readers, consider a reward system which can help motivate your child to create the habit of reading. The concern should also be less about the quantity of books read, and more about integrating reading, for a specific amount of time, into our everyday schedules. Once you get your child settled into that routine, reading will become an activity that is practiced regularly, and the skills will begin to build. Celebrate their wins as they progress, focusing not only on the skill improvement, but also on the creation of a valued family activity. For children that may struggle with reading, using technology may encourage them to practice their reading. There are some wonderful online, free tools available (assuming your kids have access to a computer or tablet) to help with their reading. · Bookshare – An accessible online library for people with print disabilities. Books are available in audio format, large print, or braille. · NaturalReader is a free text to speech application. Kids can copy and paste or upload a document and then read along with the text as it’s read. · Rewordify will simplify text to make it easier to understand. Kids can paste text or a web address into the tool and, it will provide easier text in its place. There are many other ways to help your kids become super readers. The key is really about supporting them in whatever way works best for them. It’s about ensuring that reading is an exploration into their curiosity which ultimately becomes a valued and enjoyable activity and not a chore. The inevitable debate that occurs after the tragedy of a school shooting is usually centered around gun control and mental health. With regard to gun control issues, keeping guns out of the hands of young people emotionally at risk and those with mental health issues is something on which we can all agree. Politicians need to address gun control in a non-partisan way, and, hopefully, do their part in making sure that this never happens again. But the cause of violence in schools is never the result of one issue. Mental health, and the emotional well-being of our young people is another critical issue which needs to be addressed as well. As a parent, grandparent, and former teacher, I’ve seen students struggle with emotional issues as much as with academic issues. And as a Student Teacher Field Supervisor, who is presently in the schools, those issues are still prevalent. Just this past week, my student teacher approached me about a young girl in the classroom. The student was disruptive, argumentative and clearly having a problem in class, for no apparent reason. Yet, there was something causing this student to behave the way she did that clearly had nothing to do with academics. It's a challenge for teachers to address all the things that affect a student’s ability to function in class, in a productive way. Educators need to not only identify and address the student's underlying issues that are causing disruptive behavior and help that student, but also maintain a positive learning environment for the rest of the class. This is not an easy task, and teachers need to be supported in their efforts. As educators, we’re primarily focused on identifying students at risk academically, but we also have to put greater resources into supporting efforts to identify kids who are at risk emotionally. Students’ improved emotional well-being will not only lead to all around better academic outcomes but will create a more positive learning environment for everyone as well. So how do we move forward to implement a system that addresses the emotional well-being of young people? First, it is important to understand that the school and school district cannot be solely responsible for dealing with and solving the growing concerns of the emotional well-being of students. It is unrealistic and completely unsustainable. Second, it will require a cooperative effort between parents, teachers, counselors, social service agencies, community groups, law enforcement, and various other government agencies to provide education and support to families and young people. We need to begin by identifying students at risk as early as possible. That means beginning in pre-school and continuing to follow those students throughout elementary school and beyond. But identifying students at risk is only part of the process. It is essential to provide early intervention programs to address and help students become confident and resilient young people who are able to resolve conflict in a non-violent way. The goal is to ultimately ensure that all students feel part of a school community where he or she feels valued and becomes a welcomed and contributing member of that school community. So, what are some of the critical steps? *Parents, teachers, and counselors working together to identify and discuss concerns about students. *Identify whether there is a clinical diagnosis for a student’s behavior and help guide the family to provide whatever help the student needs – whether it’s counseling, medication, or both. *Identify specific resources available to families for early intervention, such that parents, teachers and counselors are working together to help that student. Cooperation and collaboration is necessary because “it does take a village to raise a child!” As a society, we need to prioritize resources for families to access that kind of help. *If a student is experiencing social, emotional, or behavioral issues, educators need to work with parents and counselors to provide in-school help and support and follow up with parents at home, such that there is an ongoing cooperative partnership. This will require additional resources to allow teachers the needed time to collaborate with parents and counselors to provide this ongoing support. How do we shift the focus in education to include not only a strong emphasis on academics but also on the emotional well-being of kids? *Implementing programs to teach empathy, sharing, and caring to students. *Provide curriculum courses dealing with conflict resolution in which students have the opportunity to discuss real problems and discuss real solutions. *Provide opportunities for students to participate in a wide variety of activities which promote the uniqueness of students in a welcoming and inclusive environment. *Provide additional on sight counseling and mental health opportunities for students. *Reduce the counselor-student ratio, shifting their focus to include not just scheduling classes or academic counseling to helping support the students with any emotional or support issues. *Bring in additional mental health professionals to support teachers and other school staff and personnel to identify and provide help to all students in need. *Provide additional after-school programs where students connect with adults for help and support as well. *Reduce teachers’ academic workload so they can take a greater role in supporting students in non-academic ways. We can all agree that supporting the mental and emotional well-being of our children is critical. We have to make it a priority and provide the necessary resources to implement programs and provide support to families and educators to work together to help children grow into emotionally healthy and academically prepared students. In the aftermath of a school shooting or other tragic event involving kids, it’s difficult for parents to know what to say to their children. Especially for younger kids, we’re not sure how much information to share or how to share it. Like most important conversations, your messaging will be tailored based on the ages of your kids. The conversation with your preschooler will look very different than the discussion you have with an older child in middle school or high school. Many experts recommend that if you have a child younger than eight, not to have the conversation at all, unless your child brings up the subject. Even then, the conversation should be limited to acknowledging that something happened and that you and everyone at school will keep your child safe. Some younger children have a difficult time processing certain information, so a parent has to use language that is not only age appropriate but also specific to their child and their level of experience and exposure. If you believe that your younger child may hear about the tragedy from another child at school or somewhere else outside of the home, it’s important to talk with them as well to prepare them for hearing the news. For younger kids, it’s important to limit the conversation to the basics and make sure to reassure them and leave them with a positive message. Once you’ve initiated the conversation, it’s very important to listen and acknowledge fears. It’s important to reassure them without being dismissive. Young children have a tendency to ask the same questions and have similar conversations over and over again, because that’s one of the ways they process information. So, it’s important that you answer willingly and try to be patient. As kids ask questions, it’s important to be honest, especially for older children. Think about how much information you want to share. With every question, try to bring it back to the positive and reinforce that they are safe at home. Obviously, with all the media coverage and your child’s exposure to social media, older children are well informed as to what is going on with regard to school shootings, when they occur. It becomes even more important, at those times, to reassure your child that extra security measures are being discussed and implemented at school. Images will stay with kids far longer than words. It’s important that you limit their exposure to images both on the television and on the internet. For smaller children, they may not understand that a loop of video is the same event, and not multiple events. If children do see some images from the shooting, try and counteract them with positive images and stories, like the bravery of the rescuers. Kids find comfort and safety in routines, so it’s important to try and keep to the normal daily routine as much as possible during these times of tragedy. Having these conversations can be difficult with your child. Just remember to remain positive, to listen, and to provide support reassurance. With the proliferation of social media and mobile devices, we've seen its positive impact – the ability for people to connect, to share information, and to develop an awareness of issues and ideas outside of their normal world of experience. But social media and mobile devices also present serious and destructive challenges for kids of all ages, one of which is cyberbullying. Cyberbullying is not so different from regular bullying – but it's done through digital devices like mobile phones, tablets, and computers. Kids that are cyberbullied are targeted via email, instant message, text, or online on social media platforms or web sites. Kids that are cyberbullied often find themselves receiving hurtful messages, the subjects of false rumors or online posts, or find their private information and stories shared only to cause embarrassment or humiliation. According to dosomething.org, more than 40% of kids have been bullied online. Of that 40 %, 25% have been targeted more than once. If you suspect your child has been a victim of cyberbullying, what can you do? Is there a change in your child’s social media habits? Is your child exhibiting sudden mood changes, altered sleeping patterns, anxiety, or stress when using electronic devices, or hiding his or her screen when others are around? If you notice some of these behaviors, it is possible that your child may be a victim of cyberbullying. Unfortunately, only one in ten children will actively report cyberbullying to a parent. So, it’s important for parents to ask questions about any concerns they may have and provide a safe and judgement-free environment for their children to open up about what’s happening in their lives. Open and honest communication, on an ongoing basis, is critical. Before taking any immediate action, it's really important for parents to listen to their child, get all the facts and understand the exact nature of the cyberbullying. While it's important to take your child's version of the events seriously, it can help to hear all sides to truly understand the root of the issue. Allow your child to show you and describe what’s been happening, how it makes them feel, and which other kids are a part of the cyberbullying. It’s important for your child to be vocal about the situation and for you, as a parent, to understand how it is affecting your child. In light of everything that is going on in society, it is understandably one of a parent’s worst fears that their children might be victims of cyberbullying. 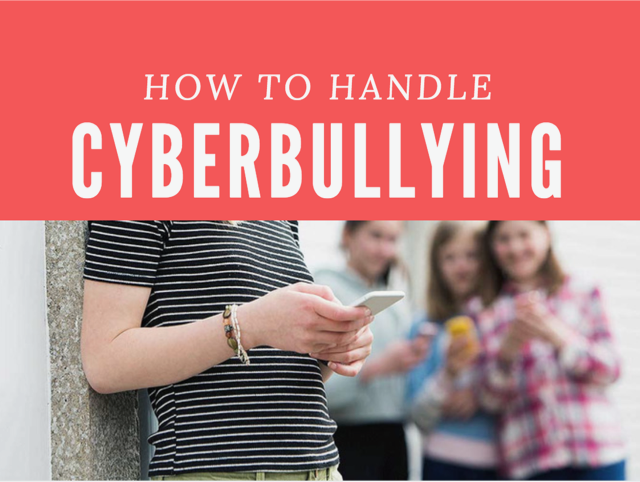 Because of the negative impact cyberbullying has on kids, it is important for parents to stay calm and discuss ways to begin to resolve the problem. It’s equally important for kids to be part of the solution so that they learn how to deal with the situation, regain a sense of self-respect and control, and feel empowered to stand up for themselves. Too many young people have been bullied at some point in their lives, and if left unaddressed, it can lead to serious emotional scars that have long-lasting effects way into adolescence and adulthood. For the health and well-being of all children, it’s important to recognize acts of bullying and address it sensitively and directly so that kids understand its destructive impact. All of us: kids, parents, teachers, and other adults, can help put an end to it.